I love it when pieces of a puzzle fit together! Years ago I purchased a few vintage ephemera items - candid portrait promotional cards. The cards were not by themselves very noteworthy, but as I read them over I started wondering about the mechanics of the promotion and how successful it might have been. I let my imagination develop a possible scenario and created a page on this site to tell the story. You'll find a sample card and my speculations on the Candid Portrait Promotion page. Years later, at a flea-market, I came across the camera that was used in this promotion. My first impression was, "what is that ugly thing"? At first glance it looked like a home-built contraption that could just possibly be a camera, so I moved in for a closer look. That's when I noticed a small stack of paper cards protruding from a tray at its base. Wow! Those cards, though different from the ones I'd found years earlier, were making exactly the same sales pitch. If over the years the cards had become lost and separated from the camera, I would probably have no idea what I was looking at. I would have assumed this to be a home-made, one-of-a-kind camera and interesting sculptural object. Caught off-guard, I did a poor job of concealing my excitement from the flea market seller - not a good negotiation tactic. The promotional cards can be seen protruding from the dispenser at the base of the camera. This great looking portrait machine (now that I've bought it, it's no longer ugly) consists of a ca 1926 DeVry Standard 35mm cine camera mounted on its side to a wood and metal stand. The ungainly thing on top is a very effective wood-bodied ground-glass reflex viewfinder. Head to toe, this elegant object is 17 inches tall. 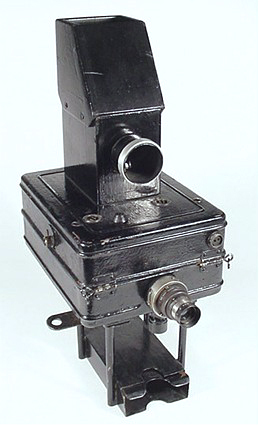 The DeVry motion picture camera is an interesting item in its own right. It takes 100 foot 35mm film loads. It can be operated by hand-crank or via its internal spring-motor drive. On this modified camera the hand-crank is not usable because the large viewfinder is in the way. 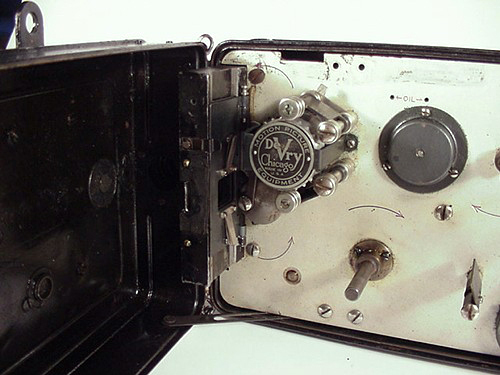 The spring-motor drive, transport and shutter are still functional. The interchangeable lens is an f 3.5 Cine Velostigmat with helical focus to 2 feet. A few modifications have been made to the camera. The normal viewfinder has been removed and the reflex focusing viewer has been blocked. 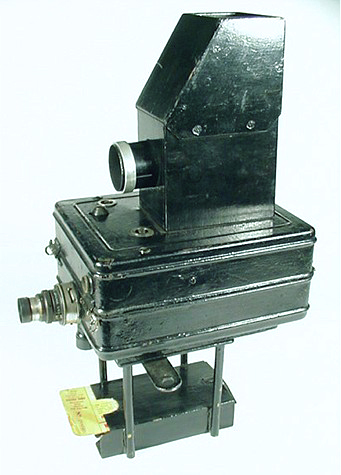 This view shows the camera opened for film loading. The DeVry logo is visible on the top of the film sprocket. DeVry Corporation, located in Chicago, Illinois USA was the manufacturer of the cine camera, but I am certain that the candid camera outfit was not made by DeVry, but assembled from used or old-stock bodies by another firm or individual. I don't think the candid camera in my collection is a one-of-a-kind. 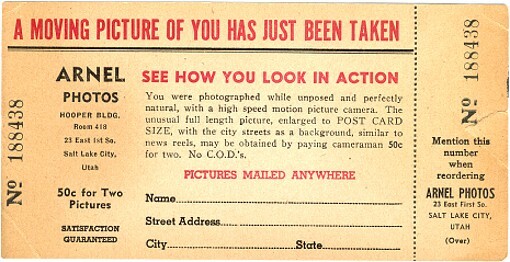 The promotional cards and cameras were probably sold as a kit to street or itinerant photographers. I hope to locate an advertisement for this setup. I would like to hear from anyone with information about this marketing promotion, camera, or photographers known to use this system. The cards that accompanied the camera were from Arnel Photos of Salt Lake City, Utah USA. The cards on the Candid Portrait Promotion page were from a Sacramento, California PayLess Drug Store. The PayLess cards cannot be older than 1940 as the first PayLess store opened in Oregon in 1939. I have not yet learned the date the Sacramento store opened for business. The PayLess cards are not exactly alike. 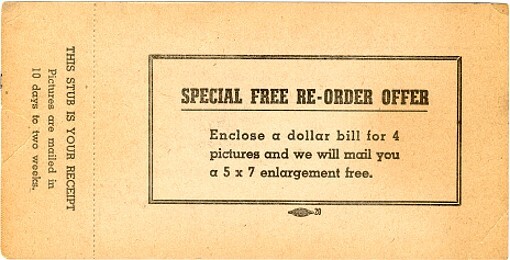 One that is not shown on the Web page states that a moving picture has been taken, as does the card above. The PayLess card shown on that page uses a graphic representation of a cine camera. For these reasons, I had wondered if the camera used in this promotion was a cine camera. Well, that question has now been answered. Never satisfied, a few questions remain. Who created this business opportunity? How well did it work in practice? What years was it available? Did the photographer operate the camera remotely? Was it really inconspicuous and therefore actually capturing people in their natural state? Did people resent being photographed unawares? If the camera was setup inside a store, how was the area lighted? I suspect the bracket directly underneath the camera may have served as a mount for floodlights. If so, wouldn't the camera be obvious? I'm sure in a few years I'll find more answers. A friend once told me that time was God's way of keeping everything from happening at once. Collectors understand the meaning of this.